I’m ready for a low carb sushi party. Who’s with me? I actually just posted a recipe for low carb salmon and cream cheese rolls a few weeks back. And before that there was my recipe for cauliflower rice chirashi. But I recently learned about a new kind of low carb sushi wrapper, so I’m writing to share a recipe using these newfangled soy wrappers. These low carb soy wrapped spicy salmon rolls come together really quickly. First you mix up some canned salmon with mayonnaise and hot chili oil. Then you add the mixture to the end of a soy wrapper. Top the salmon with a few slices of avocado and roll that baby up. These low carb Soy Wrapped Spicy Salmon Sushi Rolls have just 2g net carb each. 1. Shred canned salmon with a fork and mix with mayonnaise and chili oil. 2. Slice ripe avocado into 1/3 inch wide strips. 3. Use a sushi mat if you have one. Moisten one short side of a soy wrapper with water. 4. Spoon salmon along the opposite short side. Use 1/3 of the salmon to make a log shape along the edge of the wrapper. 5. Top the salmon with 1/3 of the avocado slices. 6. Starting with the side with the ingredients, gently begin rolling the sushi roll over itself. Place your thumbs underneath the bamboo mat and lift the edge that is closest to you up and over the filling. 7. Curve the rest of your fingers over the bamboo mat and gently press along the length of the sushi roll. Pull the edge of the bamboo toward you to fold it underneath your hands, then continue to roll the sushi away from you until you’ve rolled past the moistened end of the soy wrapper. 8. Press your fingers along the edge to seal it. 9. Use a large very sharp knife to cut the sushi roll into 1 inch wide pieces. Repeat with the 2 remaining rolls. 10. Serve with soy sauce. 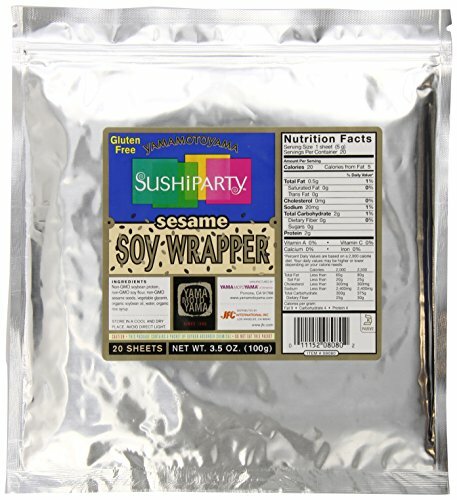 Never tried soy wrappers befor but I just ordered them from Amazon. Can’t wait to try this recipe. Awesome. Let me know how you like them.